A large part of home owner maintenance is paying attention to little things. Areas that are above or below the line of sight, tend to be the most neglected areas. Deterioration, rot and leaks can hide in these areas that are just out of sight. These areas are the places that keep home inspectors in business. Plumbing supply and waste lines are always in areas that are out of sight. Special attention needs to be paid to these pipes periodically. Small leaks under the sink, or worse, in the crawlspace, can lead to big issues. For those of us that do not really want to go into the crawlspace……. 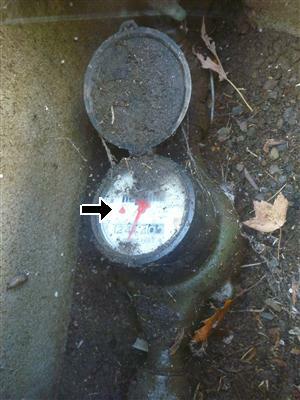 there is a secrete little leak detector on most water meters. The little dial on most water meters have a little red or white triangle. The triangle will spin with very little water movement. This can be a pretty handy way to check for leaks without actually going into the crawlspace! On a recent home inspection in Silverton, Oregon I noted the red triangle spinning. No water was being used in the home…… The buyer and or seller now have some more investigation to do. As an attentive homeowner you should check this “little thing” to ensure that your supply pipes are not leaking. ← Things that go Pee in your Crawlspace.